Aaron was born and raised in North East Ohio before moving with his family as missionaries to Nairobi, Kenya where he lived until graduating high school. As a graduate of Wittenberg University and Marquette University, he went on to have success with non-profit and public health consulting, and realized early on he had a "knack" for leading organizations through periods of change toward sustainable growth. As life and circumstances would have it, he found himself increasingly using his gifts and volunteering with churches and faith-based social ministry organizations to help them become healthy and sustainable. In 2014, he published a book on discipleship with his dad, and has facilitated seminars and leader trainings for churches wanting to set up small group ministries. 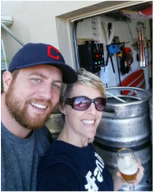 His love of brewing began as a graduate student in Milwaukee, WI and the hobby officially turned into a passion when Joelle suggested he convert the garage for home brewing. Aaron and Joelle both believe that God has been fully in control of their journey, and Aaron is grateful for the many ways family have supported his obsessions and helped him to stay grounded to the faith that is at the core of this vision for a brewery church. Aaron also serves on the Synod Council for the Florida-Bahamas Synod of the ELCA, the Board of Directors for Trinity Lutheran Seminary in Columbus, OH, and is involved in the faith and school communities of Trinity Lutheran Church and School in Kissimmee, FL. In his free time he's an avid golfer, enjoys being in nature, kayaking the waterways of Florida, cooking, and Cleveland sports. Joelle moved with her family from Chicago, IL to Tampa, FL in the 90's and she's a Florida-girl through and through. She is an elementary teacher of 4th grade reading/writing. She enjoys doing yoga, and received her master yoga teacher certification about three years ago. Joelle also loves health and fitness activities and being outdoors and in nature. She regularly signs up for health challenges, and most recently completed the Disney half marathon event which raised money to fight leukemia. Joelle can also be found exploring the waters of Florida on her stand up paddle board! She received a set of golf clubs for Christmas and Aaron says she is a natural.